It can be a real hassle to find the right table for yourself, however, it can also be tricky to find the right one among all other tables out there. 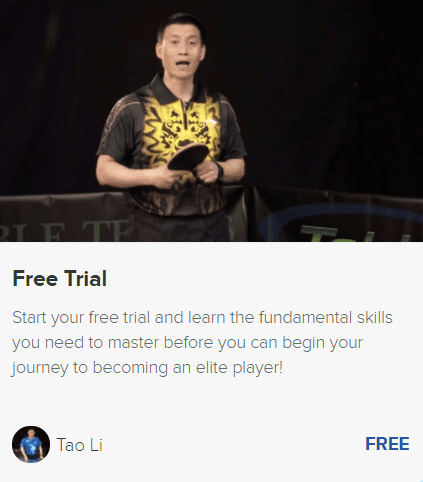 That’s why in this post I will review one of the best ping pong tables out there no matter if you are a beginner or you’re intermediate players who are really serious about the game and is going to become advanced player soon. STIGA advantage table tennis table is one of the many ping pong tables out of the STIGA lineup, which is really well known among the table tennis players. One of the most important features is that it only takes less than 15 minutes to get the table all set up and ready for play. It’s very important for people who aren’t very handy, yet they are impatient and simply can’t wait to try out the table. Another great feature would be that it’s really compact which means you will be able to store it away more easily wherever, each time after you finish playing if needed. Clamp style net is going to make things easier and absolutely faster. Simply attach the net with the clamp to the table, set the intensity and that’s it – you’re ready to play! Locking wheels are one of the best safety features. You will be able to lock the wheels when you’re playing for the best stability, but you will also be able to lock the wheels once you store the table away, so it stays in the same place you’ve put it in. Independent halves make the storing process easier, and it also gives you the ability to use each table half for another purpose. Some people use their tables for storing stuff when they’re not playing, or some even use it to eat on it or use it as a small table. Thanks to the compact design and two halves, the portability of the STIGA Advantage ping pong table is really great. You can put it anywhere in the house, or even in the garage, and you will be able to easily change the position of the table each time. If you don’t have a playing partner, but you really want to play the table tennis, you can always use one half lifted and other one laid down, so you can play ping pong with yourself. It’s a great thing if you want to practice, or simply warm up before your partner is ready. It’s a great competition table for every occasion no matter where you play it and with who do you play it. But of course, the biggest benefit of owning such a table is that you can play table tennis any time you want, no matter if you have someone to play it at the moment or not, and no matter if you have a lot of space. You can always store it away easily thanks to the 2-piece table and roller wheels. 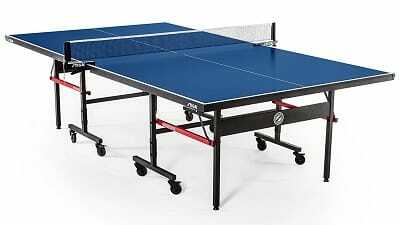 STIGA advantage table tennis table is a really well and quality made a table for all kind of different environments and different skill levels. It’s full of useful features such as clamp style net, compact and easy storing, locking wheels, independent halves and much more. There are more pros than cons as well, which is always a good thing to see. Also, the greatest feature which I’m sure many people will like is that you can use one half as a wall, so you can play with yourself whenever you want. Even when there’s no one to play with you. In my opinion, it’s a really quality ping pong table which is durable and it’s made to last for long no matter how many times you fold it or unfold it. It’s definitely a great investment for everyone who’s getting serious about ping pong. It’s available at Amazon, and the best thing is that you will get the table delivered right to your door. I’d suggest you hurry up and get this quality ping pong table.